Bling Furni is a line of furniture that was released in February 2010. Certain items from the Bling furni line are available throughout the year in the Catalogue. For Valentines 2011 we returned to 'Heartbreak Hotel' but this time with a Vegas Casino style theme. The 'Slot Machine' was the first item released to us as a teaser on January 28th 2011 along with the release of the first Heart Quests. Just a few days later on January 31st 2011 the full range of Vegas Bling was released. 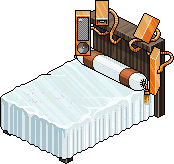 In 2014 and again in 2017, three white pieces of the Bling range were released, but these were only available in the 4 Habbo Main Street Bundle. Other white pieces do exist, but are either unofficially released or not available at all. Not officially released but is available in-client. As part of a global campaign, several old furniture lines were revived with new furniture additions during 2015. Bling was one of these. IM GONNA SWIIIINNGG FROM THE CHANDELIIIEEEEER! Gold and diamonds. The ultimate combination. This page was last edited on 13 October 2017, at 12:18.